Though I have nothing against Camaros, Mustangs, Barracudas and Corvettes, I must admit I get a little tired of a strict American Muscle diet. I own a Chevelle wagon, so clearly I am not anti-American, but jeepers this is a nice looking automobile. Sure, $20,000 is a lot of money. Plenty of money. It won't buy you toot at Barrett Jackson but you can sure get a lot of croissants for the money! Two-wheel brakes might give you pause, but when you consider this fine automobile is powered by an extremely modest 1925-era 4 cylinder engine, you are in more danger from daily exposure to peashooters and staple removers. To worry about stopping would mean you traveling at something north of 30 mph. And at 1400 French flathead cc's, I suspect that you would have bigger issues than worrying about stopping - like making sure you aren't run over by a speeding bicycle. And what a color combination. Pure class. Considering a new S-Class? Feh. 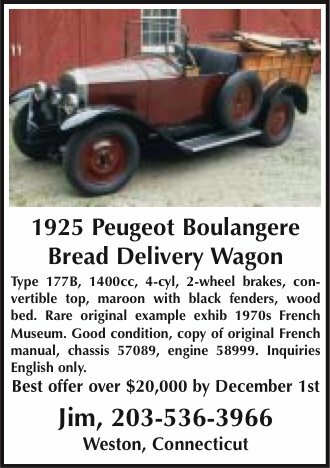 Buy an E-Class, a International Harvester COE, a Model A roadster hotrod, a VW Diesel Caddy pickup truck, a Honda Helix scooter and two of these Peugeot Bread Wagons and give me one for saving you from having blown all your money on a luxury automobile when you could have owned a whole damn museum. Hemmings ads are bad idea magnets. One minute, you never even knew Peugeot offered a Bread Delivery Wagon in 1925... two starry-eyed minutes later, you start considering door-to-door delivery of napoleans and petit fours. Seriously, say you are relaxing at home with the newspaper, hear a toot-toot from a brass horn and rush out to meet the Froggy Boulangerie Wagon. Still in your robe, you step outside to consider the baked goods of the day and have your mug filled with that superlative European hot chocolate. Money exchanged (frankly, whatever it would cost) and the Peugeot putts away in a cloud of it's own smoke.